….maybe that title needs a wee bit of an explanation. To enrol in the the Engineering program at Ecole Polytechnique, candidates first suffer through a gruelling delightful “Classe Préparatoire” — roughly 2 or 3 years of “undergraduate maths, physics, and science” — then they sit an exhaustive and competitive entrance exam. If they’re among the 400 best at that entrance exam, we let them in … keep them for 3 years … and then kick them out. If they want to actually get the Ecole Polytechnique engineering degree (and they do…) they must show that they can also make it elsewhere: go do a Masters in some (often, foreign) university. When they come back and show us their Masters degree, then we will hand them also the Polytechnique degree – usually in a very festive graduation ceremony. …and this is where you gotta love the English. 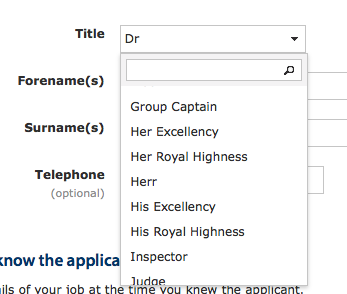 More specifically, you’ve gotta love Oxbridge…where it is automatically assumed that an academic referee, of course, might be properly styled Baron, Group Captain, Her Royal Highness, and …. Herr (???). And, where the admissions office (and, their web designers) wouldn’t be caught dead not offering the proper form of address. 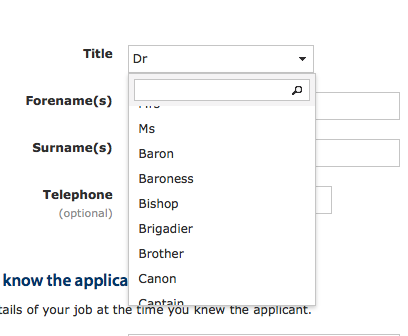 I’ll admit, it has been very hard to resist the temptation to select “Baroness” or “Bishop”…. I believe that “Bishop of the IETF” is the correct term for IESG members – and a term not to be taken in vain by random protocol wonks. But what would happen if someone from got a recommandation letter from Pope Francis (whose proper form of address is His Holiness).